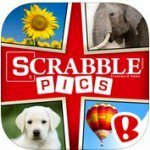 Scrabble Pics Answers, Solutions and Cheats for iPod, iPad, iPhone and Android is the latest guess game created by Backflip Studios and can be downloaded from iTunes and Google Play. Backflip Studios have created some of the most played guess games like NinJump Dash: Multiplayer Race, Paper Toss, NinJump, NinJump Deluxe, Paper Toss 2.0, Spellfall™ – Puzzle Adventure, DragonVale, Army of Darkness Defense, Dragons and Titans, Graffiti Ball, Solitaire by Backflip, Strike Knight, Hamster: Attack!, Shape Shift etc. If you get stuck please use our guide to solve Scrabble Pics Answers.